Saw Sean Merriman walking off the set when I got to the meeting spot. I didn't know who he was, until my friend told me. Yeah ~ it's football. Unless you're wearing a jersey and actually playing on the field during game day ~ I probably won't recognize you. I guess that's how it is for all helmeted athletes, now that I think about it. I didn't recognize Mike Modano (i.e. Dallas Stars) either when he came over to chat with members of the crew I was with when I was in Miami for the NBA Finals, in 2006. Lunched at The Tides with friends and took in the scene. The weather was comfortable, not too hot and not too cold. It was actually perfect. 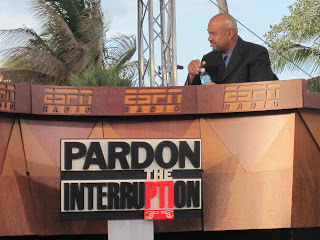 After lunch we went back to the ESPN set to watch part of the Pardon the Interruption taping. 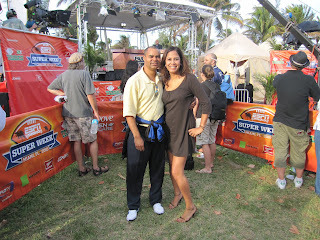 We missed the taping of the Deion segment, but c'est la vie. Watching the taping got a little boring so went to check out the other production tents, but there seemed to be nothing going on at the NFL Network and other ESPN set. 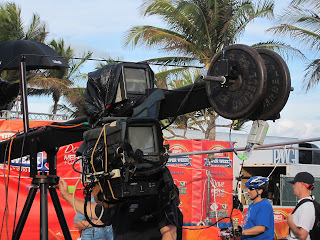 We went to watch the rest of the PTI taping from inside the gate and behind the set, and I was introduced to J.A. Adande. Taping finished and we all rolled back to get some drinks, kill time, and catch up before everyone disbanded ~ some had to go to dinner, clean up, and/or wanted to catch other games on tv before going out "for real". It's only Thursday and some of us just got to town, so we're still settling into the scene. Incidentally, we were talking music, and I've determined that Norah Jones is the female James Taylor. I ran into the guys from the plane last night, walking on Ocean Drive, on my way back to my brother's place. Very random. According to the crew I was wih, the NFL Players Association and the NFL Players party is combined this year and being held at the Viceroy. The NFL Commissioner's party is tomorrow night in Laudy and I'll be there. Cleveland is up 49-45 over the Heat. GO CAVS!! !